Wendell G Mohling Foundation Award change!! The Mohling Foundation has been giving an award amount of $500 since 2006. This is considered "incentive" money to assist in funding a K-12 Kansas science teacher to attend an NSTA conference of their choice, during the school year in which they are selected as the recipient. Beginning next year, we will award $700 to one K-12 Kansas science teacher to use toward attending an NSTA conference of their choice. While we know this still is inadequate to fund the expense, we consider it as incentive money to encourage a school district to do the "right" thing and pay the balance of the cost. School districts need to invest in the success of their teachers and in 90% of the cases involving our winners, the districts have indeed risen to the challenge. For more information, or to download an application form, please visit our website: www.wendellmohlingfoundation.com or you may access our website from www.kats.org. Applications are due Oct 1. If you are attending the national annual conference for the National Science Teachers Association we are having a Kansas meetup right outside of the exhibitor area at 11:30am Thursday, April 11th. Please come join us and network with others as we share tips and resources! Follow #KSSci on Twitter to check out any resources we share out. We hope you can make it out to the annual Kansas Association of Teachers of Science conference April 27th in Hutchinson! I am working with an amazing group of educators who are attending the NSTA conference mentioned above and will be brining really great sessions to our Kansas conference. We also conducted a Learn While Teach PD opportunity this year and many from this group will be sharing their learning there. You will not want to miss their sessions! My predecessor Matt Krehbiel will be a keynote speaker this year sharing more from his adventures leading science education nationally with Achieve. The Science and Mathematics Education Institute at Fort Hays State University is holding a really great workshop for chemistry educators June 17-28. Developing and using models is one of the central practices for our science standards and this workshop will not disappoint. There is always so much great feedback about this opportunity. I am excited to announce a great opportunity for professional learning this summer that will help you really use the implementation of the Kansas Standards for Science as an opportunity to advance instruction in your classroom, building, and district. Math and science teachers from across the state will come together to review, refresh, and retool current math and science practices and inspire educators with a focus on problem-based learning. The mornings will include guest speakers from KATS, KATM, and other chances to learn from expert math and science teachers. The elementary, middle, and high school educators that joined us for the Learn While Teach PD project will be leading our science sessions. Come learn more about using driving questions boards, talk move questioning techniques, and how to really anchor science learning in phenomena from this great group. The Kansas State Science & Engineering Fair (KSSEF) brings together all students advancing from local and regional science fairs happening across the state. The Kansas State Science and Engineering Fair is an ongoing annual project, occurring on March 29. 2019, at the Cessna Activity Center in Wichita, Kansas. KSSEF represents an excellent opportunity for aspiring students across Kansas to challenge one another, and themselves, to expand their knowledge of the scientific fields. Students will gain experience in critical thinking, leadership, and develop their problem-solving skills. The winning students will receive numerous awards that include trophies, cash, and scholarships. Students competing at the KSSEF will have competed at one of the six regional science fairs within Kansas and finished in the top 25% of their respective division. Students are required to have completed their own scientific research and must present their findings in both written and oral formats. Students who were judged to be in the top 35, or 25%, of their division in the regional fair will advance to KSSEF. The fair will showcase over 200 projects from students in grades 4-12. How to get involved with KSSEF. Volunteers in STEM related fields are scheduled to meet with students and judge their scientific research at KSSEF. We are in need of more judges and If you are interested in volunteering as a judge, please complete the application below or pass along to others you know that may be able to help out. Please find a link below to access the most recent KSDE Science Newsletter. NASA’s Northwest Earth and Space Sciences Pipeline invites teams of students in grades 5-12 across the United States and territories to recreate the Apollo 11 moon landing using a drone and a LEGO Mindstorm robot. Organizations will run the Apollo Next Giant Leap Student (ANGLES) Challenge locally to select a team to advance to the nearest regional challenge hub. The top team at each regional challenge hub will earn the grand prize of a trip to Johnson Space Center in Houston, Texas! Humans in Space Youth Art Competition! The SciArt Exchange invites young people 10-18 years old to submit visual, literary, musical and video artwork about what we will do on the Moon and why it is important. Entries are due April 30, 2019. 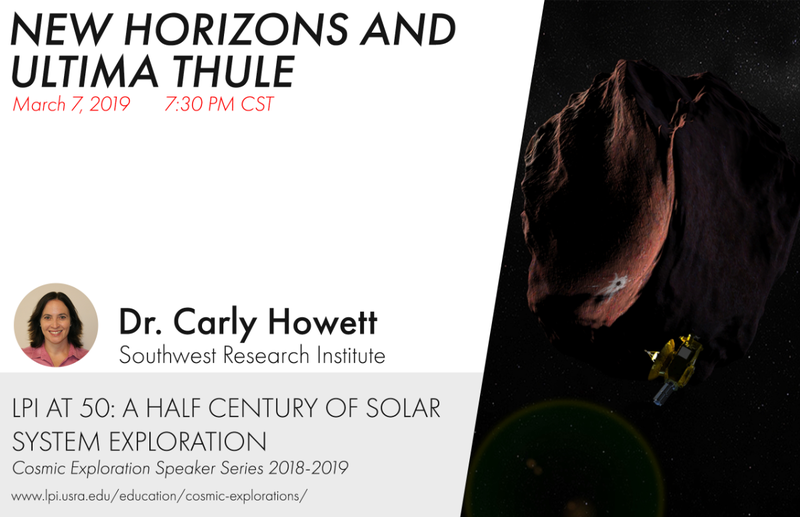 Join us in person at the Lunar and Planetary Institute in Houston or online on Thursday, March 7, to hear Dr. Hewett give an overview of the incredible observations the New Horizons mission made at Ultima Thule. This presentation is part of this year's Cosmic Exploration Speaker Series theme, "LPI at 50: A Half Century of Solar System Exploration." The online LPI Earth and Space Science Newsletter has links to events, workshops, grants, opportunities for students, and other science news. Real World Science is a weeklong summer seminar for 5th-8th grade science teachers that explores key STEM concepts using real-world WWII examples. Twenty-eight teachers from across the country will come to New Orleans to experience hands-on how necessity, knowledge, perseverance and skill lead to inventions, innovation, and careers in STEM (Science, Technology, Engineering, and Mathematics), just like in World War II. WHO CAN PARTICIPATE: The seminar application is open to any 5th-8th grade science teacher (public, public charter, private, and parochial), who will be teaching a science course to students in the same age group in the 2019-2020 school year. Applications will be evaluated through a competitive process that will include information on teaching experience, a short written statement, and two letters of recommendation. Teachers newer to the classroom are encouraged to apply. Applications will be accepted from January 7 – March 15, 2019. COST: This seminar is supported by a grant from the Northrop Grumman Foundation. Teachers will receive free room and board in New Orleans, a travel stipend, and all seminar materials free of charge. Regional Outstanding Educator: Each region may choose to identify an outstanding science educator. The individual must be a KATS member, in its region for recognition KATS Kamp. Nominations are due to one of the members of your Regional representatives by February 1, 2019. The Regional Representatives will provide the name of the selected individual to a Nomination and Awards Committee by February 8, 2019. The winner will be contacted for biographical information to be used in publicity related to the award. A nomination consists of contact Information of the nominee, a written narrative describing the outstanding contributions/events that indicated the nominee is deserving of the recognition, and any other information that you feel is important in consideration for the award. Distinguished KATS Member Award: This award is designed to recognize KATS members who have made significant contributions to KATS and science education. The award is presented to one individual each year at KATS Kamp. Nominations are due February 1, 2019 to Carol Bonham. A Nomination and Awards Committee will select the awardee. A nomination consists of contact Information of the nominee, a written narrative describing the outstanding contributions/events that indicated the nominee is deserving of the recognition a written narrative describing the outstanding contributions/events of the nominees to the KATS organization any other information that you feel is important in consideration for the award. KATS Outstanding Contributions to Science Education in Kansas: At the August 25, 2012 Board Meeting, KATS established an award to recognize outstanding contributions to science education by an organization or individual(s) Selection of the award winner is done by the Nomination and Awards Committee from nominations from by KATS members. The award is not an annual award; zero or more awards can be made in any year depending on the quality of qualified nominations. The award winner will be recognized at the KATS Meeting, formal presentation of the award will be at a venue identified by the award winner. Nominations are due February 1, 2019 to Carol Bonham. A nomination consists of: contact Information of the nominee, a written narrative describing the outstanding contributions/events that indicated the nominee is deserving of the recognition any other information that you feel is important in consideration for the award. Please send an email to me carolb@prattcc.edu if you have any nominees or any questions. Thank you for your assistance! We are happy to announce two great partnerships for upcoming virtual K-12 science professional development opportunities. Many have reached out this year requesting Kansas Science Standards opportunities for district and building K-12 science leaders in your setting. Graduate credit is available for both partnerships and this would be a great opportunity for a number of different science education needs I often hear working with buildings and districts across the state. This opportunity is particularly helpful for rural school districts where travel for professional development may be more difficult. Elementary educators teaching science have special considerations and the NSTA partnership will help support this grade band in much more depth. Learn how to better use the resources you have in your school district no matter how old or new they may be. PD is still needed to know how to make better use of those resources! Please let us know if you have any questions. Thank you for your consideration. Applications are now being accepted for the 2019 MAPS EPSCoR Ecosystems of Kansas Summer Institute ( https://epscoroutreach.ku.edu/) for Kansas High School Biology/Environmental Sciences teachers that will be held June 17-21, 2019 at the Konza Prairie Biological Station (near KSU). Teacher participants will earn a stipend of $750 for actively participating in the week’s activities and writing curriculum. In addition, a travel allowance will be provided for those living more than 1 hour away from the field station. If you or they have any questions contact Peggy pschultz@ku.edu or me. We are excited to announce details of the 2019 Kansas KidWind Challenge. Please take a look at the details below and check out the attached informational flyer. This year, we’ll be expanding the Challenge to include four regional and one statewide KidWind Challenge. For those who have participated in the past, we recognize the events are being held earlier in the year than usual and apologize for any inconvenience. This will allow teams from across the state to better participate and provide more time for preparation before the national KidWind Challenge. We’ll be hosting two informational webinars on Thurs, Dec. 13 and Mon, Jan. 7 at 3:45pm, so please consider attending. The webinars will be recorded, even if you can’t make either of them. Click on the hyperlinks above or visit www.kansasenergyprogram.org/kidwindchallenge to sign up. More information about the events can be found at www.kansasenergyprogram.org/kidwindchallenge. If you have any questions at all, don’t hesitate to reach out and ask.